Welcome to another edition of RCB Behind the Scenes! We have a couple exciting gigs to share with you. As part of our Community Concert Series sponsored by the Eden Hall Foundation, we performed at a rooftop party benefiting the Center that CARES at the beautiful Jaron Xavier Grayson Community Center. With a great audience and a great view, it was a blast. This past week, Maestro James Gourlay and River City Brass travelled to Knoxville, Tennessee, to take part in the International Tuba and Euphonium Conference. James spent the week conducting, playing, and teaching, and the band joined him on Saturday for a fabulous concert. 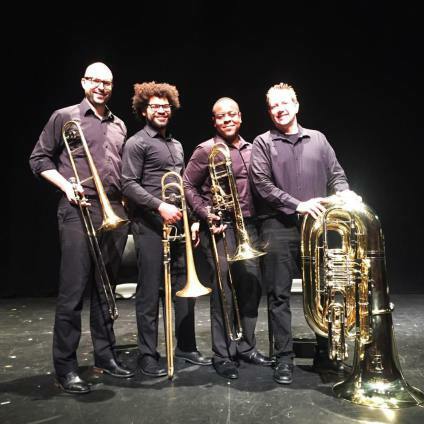 The RCB trombone section (John Sebastian Vera, Gabriel Colby, and Hakeem Bilal) and tubist Brian Kiser also performed as a quartet. We have some seriously talented people in this group! Photos via James Gourlay, Linda Reznik, Gabriel Colby, Hakeem Bilal, Brian Kiser, Brandon Thibault, Sam Buccigrossi, Matt von Emmerik, and Hidehiro Fujita.